This was just an experiment with "indoor lighting." Inspired by Abyss... PLEASE comment. Very cool effect. Would love to see a black version. You always do such GREAT skins, but, alas, there is never enough info within them. I really like these. The lighting effect is outstanding. Please include more info?? 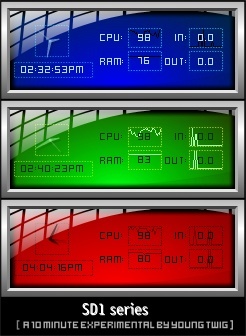 I'm not running my computer in a room that has 20 windows on one wall, but cool idea. Yeah, my room only has one window, so, I guess it might not be realistic to me or you, but I can say I've been in a room where an entire wall was windows.